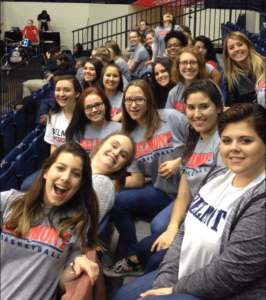 The Nashville Mercy residents cheered the Belmont Women’s Basketball team to victory on Wednesday, November 15th at the Curb Event Center in Nashville, Tennessee. 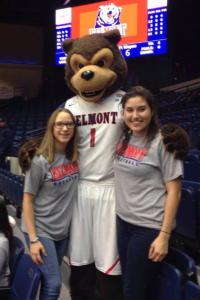 The Belmont Bruins beat the Fort Wayne Mastodons, 74 to 42. The Belmont women’s basketball players and staff came to the Nashville Mercy home earlier this fall. They were given a tour and enjoyed dinner with the residents. The team graciously invited the residents to a game and gave them Belmont shirts to wear. The residents had an incredible evening watching Belmont senior, Sally McCabe’s, first double-double of the season. They also enjoyed concessions and snacks inside the Curb. The victory marked head coach Bart Brooks’ first career win on the Curb court, moving Belmont to 16-7 in home openers since becoming a Division I program. Belmont University is a private, four-year university. Belmont brings together liberal arts and professional education in a Christian community of learning and service. The University’s purpose is to help students explore their passions and develop their talents to meet the world’s needs. After the game, the team held a meet and greet with the residents and invited them to see the locker room. The team enjoyed time of community with the residents while celebrating their victory. Mercy Multiplied is grateful to the Belmont Women’s Basketball team and staff for the hospitality and warm welcome. For more information on how you and your organization can partner with Mercy to impact the lives of young women, click here.